This weekend, we’re giving all fans on PlayStation 4 a chance to check out Call of Duty: Black Ops 3’s Awakening DLC map pack for free* for a limited time. Beginning Friday, April 1 at 10:00am PDT and through Monday, April 4 at 10:00am PDT, anyone playing Black Ops 3 on PS4 can play Awakening’s mind-bending Zombies experience, Der Eisendrache, and four new multiplayer maps: Gauntlet, Splash, Rise, and the reimagined fan-favorite from Call of Duty: Black Ops 2, Skyjacked. If you want to continue playing the DLC after the free trial has ended, you will, of course, have to purchase the map pack at the usual price, and just in case you needed any more encouragement to play, double character and weapon experience will be turned on for the entirety of the free trial for all platforms – not just PlayStation 4. 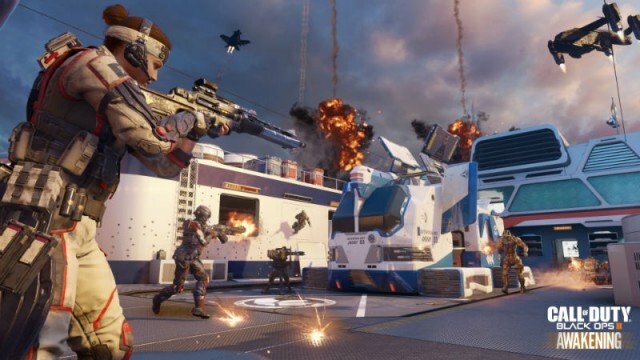 If you’ve already tired yourself out on Call Of Duty: Black Ops III‘s current multiplayer content, Activision will be giving you a good reason to come back very soon – the publisher will be announcing the game’s second DLC pack later today. It also emerged yesterday that, contrary to previous comments suggesting that last-gen consoles wouldn’t be seeing any DLC releases, the Awakening map pack will be available for PlayStation 3 starting next week. Unfortunately, though, there’s no word on the Xbox 360 getting the content at any point.